iOS includes its own emoji keyboard as standard, and although you have to manually activate it yourself via the Settings app, it does provide a decent enough selection of smiley faces and emoticons for some additional, paralinguistic context. But after a while, what might at first have appeared a wide and colorful selection quickly becomes a little boring, and suddenly, the cute little smiling cat face has us annoyed to high heaven. At times like this, it’s nice to have other options, and Vmoji, which has long since offered support for unicode fonts, has now been updated for full iOS 7 compatibility. Check it out after the break! Once you’ve downloaded Vmoji 7, you don’t need to configure any settings, rather just fire up your note-taking / instant messaging / favorite keyboard-requiring app, type in the letters “123” on the keyboard, and by pressing and holding any key, you’ll see a bunch of different unicode fonts show up. With over 800 in total, you’ll never be stuck for something new and interesting to include in your conversations. Vmoji 7 works fluidly with the standard English keyboard, and although it may function with others, the developer offers no guarantees. Although things can seem a little scattered at first, particularly given that every unique key long-press harbors its own treasure trove of unicode symbols, it doesn’t actually take a long time to get used to where things are, and with such a broad range of options, it’s like a one-stop for fans of emoji / unicode icons in one fell swoop. Vmoji 7 has just landed over at the BigBoss repository, and will set you back $2.99. Sure, it’s a little on the steep side, but considering how many different symbols are on offer, you actually paying only a small fraction of one cent for each. Download it, give it a try, and be sure to leave your comments below. 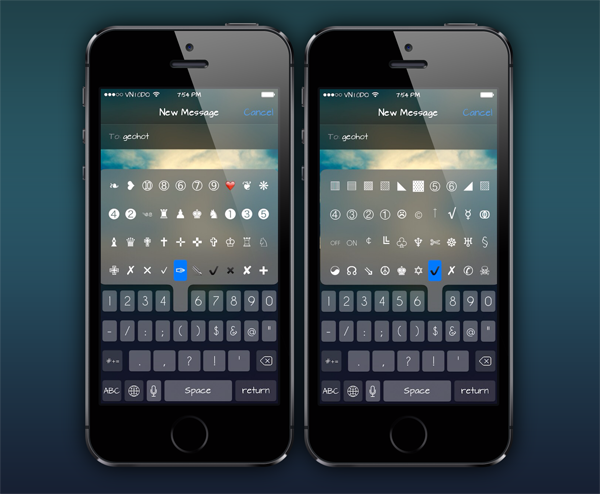 And if you’re willing to add just unicode faces to your iOS 7 keyboard, then be sure to give UniFaces a shot.